It is a new theatre. An essential work, simple and functional to our project, integrated into the landscape of the Valconca valley as if it were a big leaf on the lawn. The colour green, wood, stone and glass are the eco-compatible elements the theatre structure is made of. It was designed in harmony with the surroundings in order to meet the ethical requirement of creating balance between the physical and the cultural environment. Its roofing is the first noticeable architectural element. It is made of tiles in polychrome material that has the shades and colours of nature. The structure is made by laminated timber, the inner walls are brick-faced, and wood and terracotta tiles were used for the flooring. The large windows with their view over the valley are a source of natural lighting and they call the horizon into play as an element of theatrical and scenic inspiration. The building includes the foyer, dressing room facilities, storage and control rooms and cloakrooms. The theatre is fitted with water-based underfloor heating, adjustable modular lighting and telescopic grandstand seating which can accommodate 200 people. The entire building has been realized in accordance with the current regulation on the removal of architectural barriers. The portico with its shadings helps in creating a favourable inner microclimate during the summer season and can also host outdoor events. The Dimora Theatre was designed by architect Gianluca Canini and surveyor Enrico Marfoglia and was inaugurated in Spring 2004. 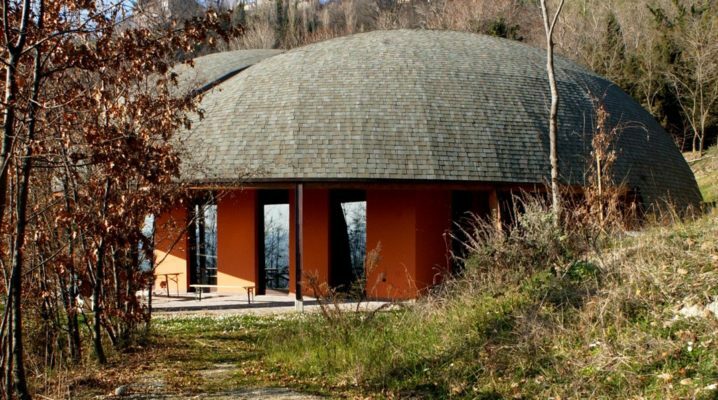 It is a dimora (an abode) that welcomes the work of the artist and of the craftsman, the poetical thoughts and the gestures: dedicated to creative residencies, workshops, theatre productions and hospitality. Dedicated to meeting with others. Today the Dimora Theatre fully embodies our idea of common home for the contemporary arts, a place dedicated to the research and production, and most of all a place where people can meet and relate. The Circle of the Dimora. The chronicle reports that on the 18th of December 1827 the amateur dramatic society of Mondaino was granted permission to build their seat, which then took the name of “Teatrino” (little theatre). The Teatrino was built as conceived by master builder Meluzzi and painter Felice Orlandi, from Rimini, utilizing the bricks obtained by the demolition of the former local doctor’s house. Divided into three regular semicircular orders, each order split into nine upper tier boxes, the Teatrino was inaugurated in 1832. In 1919 the premises adjacent to the nunnery were temporarily turned into an elegant little theatre, thanks to Anacleto Cecchini. A first series of performances were interpreted by humble workers’ daughters and nevertheless favourably greeted by the local public. The turning point came on Sunday, the 11th of January 1925, with the inauguration of the parochial hall. The small premises had about a hundred seats and a wooden stage with foldable drapes and a series of backdrops designed by Caio Galliano Polidori. Finally, on the 28th of October 1927, the citadel’s theatre was settled in the hall that is nowadays known by the name of “Durantino”.